It comes from Latin "argentum", which means silver. The origin of this name goes back to the first Spanish Conquerors that came to River Plate. Shipwrecked persons of Juan Díaz de Solís expedition found in the region natives who gave them presents made of silver so, in 1524, they took to Spain news of the existence of Sierra del Plata (Silver Mountain), a mountain rich in that precious metal. Since then, Portuguese people called Solís River , River Plate. Two years later, Spanish people started using this name. The National Constitution sanctioned in 1853 included the name " Argentinean Republic " among the official names to represent the government and National territory. Situated in South America and, thus, in the Southern Hemisphere of the planet, Argentina has an extension of almost 3,8 millions of km², 2,8 belonging to the continent - with approximately 54% of plains (prairies and sabanas), a 23% of plateau and a 23% of mountains - being the rest Antarctic Area. Its 3,800 kilometres of lengh go from 22º to 55º of Southern Latitude. Argentina borders on Uruguay , Brazil , Paraguay , Bolivia and Chile with a frontier perimeter of 9,376 kilometers. The sea front faces the Atlantic Ocean and is 4,725 kilometers long. In its length from Jujuy to Tierra del Fuego , the Andes Range shows a marvelous variety of landscapes: from Northeast plateau, which are deserts with valleys, narrow paths and colorful hills, to the lakes, woods and glaciers of Patagonia . In the North, Chaco is a forest area linked to Bermejo , Salado and Pilcomayo Rivers . Between Paraná and Uruguay Rivers , the Argentinean Mesopotamia (Entre Ríos, Corrientes and Misiones Provinces ) is made up of low hills, lagoons and estuaries which are signs of the old courses of these big rivers. In some areas, immersed in the subtropical forest, there are breakings that favor spectacular phenomena such as Iguazú falls. In the center of Argentina , the Pampa region is the most extensive and well known area. It has an intense farming and cattle exploitation involving Buenos Aires Province , the Northeast of La Pampa Province and South of Córdoba and Santa Fe Provinces . The landscape is interrupted in the South by the small mountains of Tandil and de la Ventana and, to the west, by Códoba mountains. To the South, from the Andes to the sea, the sterile and stony patagonic plateau is situated being lashed by wind. The Atlantic litoral, with high cliffs, depicts wavy shapes such as Valdés Peninsula with spectacular settlements of marine animals. Argentina has a great variety in climate: mild and humid in the Pampa plain, cold and humid in the west extreme of Patagonia , subtropical in the North of Mesopotamia and hot in the Northeast. From November to March, the average temperature is of 23° C and, from June to September is of 12° C.
The current population of Argentina is over 36 millions of inhabitants out of whom almost half of them live in Capital Federal and Buenos Aires Province.These figures indicate a density of 13 inhabitants per km². 95% of Argentinean people are white, mainly descendants of Italian and Spanish. With the massive European immigration, the mestizo - cross of white and native- decreased being currently only 4.5% of Argentinean population. Pure native population -mapuches, collas, tobas, matacos y chiriguanos- represent 0.5% of the inhabitants. The official language of the republic of Argentina is Spanish. In Buenos Aires there are expressions of "lunfardo", jargon from River Plate area. The official religion is Roman Catholic though there is cult freedom. Protestant, Jew, Islam, Orthodox Greeks, Orthodox Russians and other religions are found. The oficial currency in Argentina is the peso. There are notes of 2, 5, 10,50 and 100 pesos. And coins of 1, 5, 10, 25 and 50 cents. The National territory is made up of 23 provinces and the Federal Capital- Buenos Aires. Its government, according to the National Constitution adopts the representative, republican and federal form. The Executive Power is hold by a President and a Vice-president for a period of four years. They can be re-elected for just one more consecutive period. The Legislative Power is made up of two chambers - Senators Chamber, made up of three members per province and three members from Buenos Aires City., and County Councilors Chamber , made up of representatives elected directly and proportionally to the number of inhabitants per district. The president and Vice-President of the Nation as well as Chief of Government of the City of Buenos Aires , the governors of the provinces and the members of the legislative bodies are elected via secret and compulsory universal suffrage of men and women above 18. The Judicial Power is hold by the Supreme Court of Justice and Lower Courts. Each province, in accordance with principles, declarations and guaratees of the National Constitution, and under the Federal Representative System, issues its own Constitution to govern its acts. The current Constitution is from 1853. However, it was reformed in 1860, 1898, 1957 and 1994. The last reform, from August 1994, allows the re-election of the president for one period. May 25th., 1810. The First National Government Council was constituted. July 9th., 1816. Independence was declared in the United provinces of River Plate. The flag is made up of three horizontal layers: the central is white with a rising sun and the upper and lower are light blue. The National Flower is "ceibo" and the Nacional stone is "rodocrocita" or "Inca Rose". Easter - Holy Friday April 2nd. Day of Veterans and Fallen in Malvinas War May 1st. Anniversary of the 1st. National Government June20th. Day of the Immaculate Conception December 25th. ** Holiday that is changed to the previous Monday if it son a Tuesday or Wednesday, and, is changed to the following Monday if it is on a Thursday or Friday. *** Holiday that will take place on the third Monday of the respective month. The Wine Harvest Festival in the City of Mendoza is one of the most important popular events in the agenda of celebrations in our country. The ceremony commemorates the beginnings, the sacrifice of winegrowers and their families, the harshness of the weather, the daily struggle and the end result when, after such a great effort, our beloved Argentinian wine is managed. This section summarizes this wonderful festival. 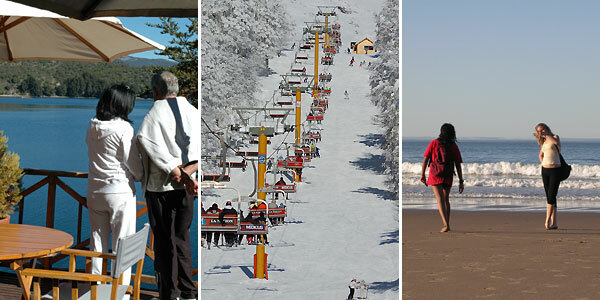 Skiing in Argentina is a unique experience capable of attracting tourists from all over the world to the privileged winter centers in our country. The coming of the snow tinges everything in white while winter sports summon more and more followers day after day. They enliven the ski resorts and the snow parks from the Province of Mendoza to southernmost Tierra del Fuego.